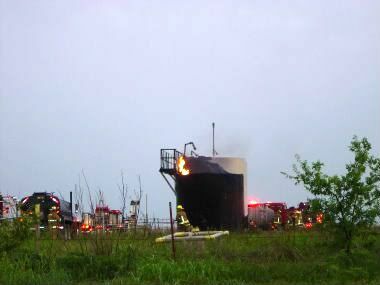 At 3:57, the Ranch Manager answers the question from the reporter, "It was a gas well or something...they [the firemen] asked me if lighting struck." A LANDMAN on the Arlington, TX City Council?? Or What Is It, Pray Tell? The Councilman does have a very nice résumé. 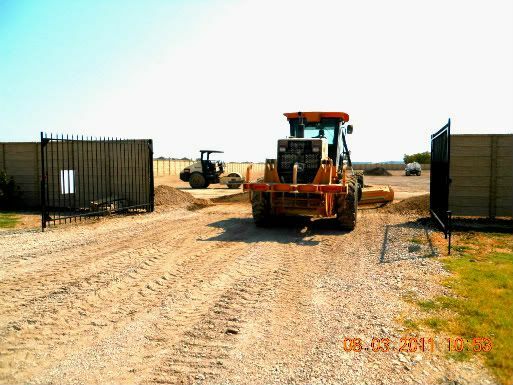 A landman is an agent hired by gas companies to negotiate with landowners in order to get a lease signed at the lowest possible price per acre with the lowest possible royalty payments for any extracted gas. In a section titled "Talking Points for Selling Oil and Gas Lease Rights," the "Landman’s Manual" explains in detail how landmen should talk to landowners, what topics they should talk about and what topics to avoid. The manual says that "successful field agents understand what points to focus on so the benefits outweigh the cons." According to the manual, most landowners don’t know the difference between hydraulic fracturing and slick water hydraulic fracturing. The landmen are told to use this fact to their advantage, but to avoid the topic if a landowner does know about slick water fracturing. The manual stresses the importance of telling landowners that China bought more oil than the U.S. last year. "Fear of foreign encroachment is the biggest asset we have in selling our development strategy," it states. Whenever the conversation with a landowner turns to local issues or environmental hazards, the landmen are instructed to reiterate the fact that China bought more gas than the U.S. last year. Landmen are told to avoid talking about property values. 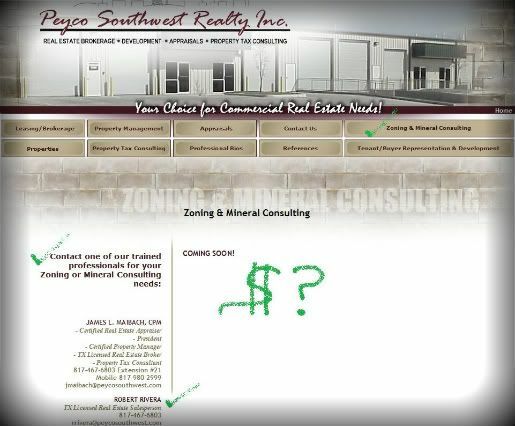 According to the manual, multiple studies have found that property values decrease for land with oil and gas leases on the property and several major banks have stopped issuing mortgages on these properties. If backed into this issue, the landmen are told to "talk about the potential revenues and the overall needs of the nation" and to once again reiterate the point that China bought more gas than the U.S. last year. The manual instructs the landmen to talk to men whenever possible because "men are more likely to sign than women. Men don’t like to believe that they know less than you do, so they are less likely to ask questions." The Water Mafia Strikes Again!! FORT WORTH (CBSDFW.COM) August 23, 2011 - While many North Texans are being asked to conserve water during a statewide drought, three large pipelines are pulling millions of gallons of water out of the Trinity River in Fort Worth, near West Seventh Street. 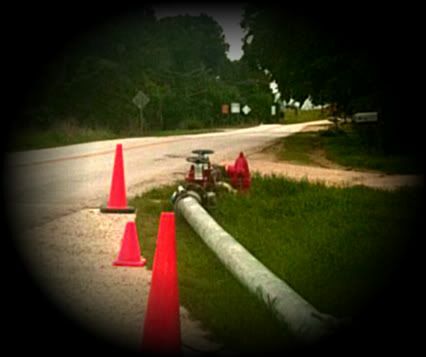 The pipelines cross over several roads and trails in Trinity River Park. 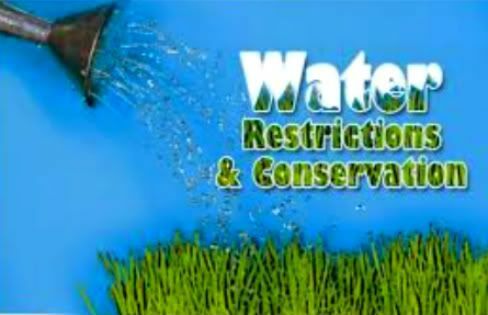 They were put into place just days before water restrictions are expected to shut off sprinklers in Fort Worth, leaving lawns to dry out. Where are the pipelines taking the water? Follow them past raised sidewalk sections and roadway crossings and you will end up at a natural gas well located just outside of Trinity River Park, operated by Chesapeake Energy. And It's Growing the Franchise. Thank you, Don Young, of Fort Worth Can Do...for Your Efforts From the Beginning. Sell It To the Highest Bidder!? 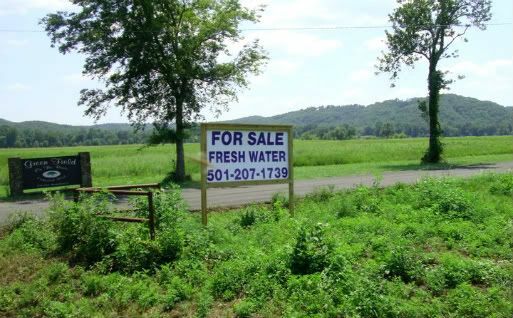 A Recent Picture from one of our Facebook Friends in ARKANSAS...Demand is High. 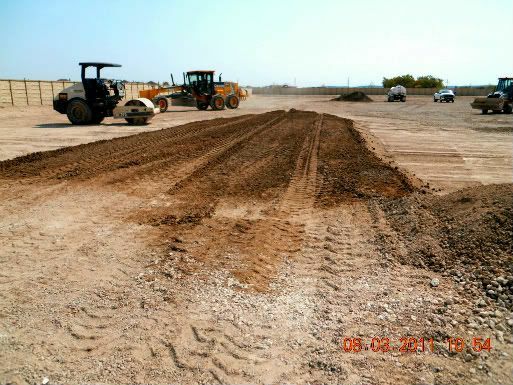 With the Ground "Watered Down,"
The Grand Prairie, TX Mandatory Water Restrictions Began on Wednesday, August 3, 2011. 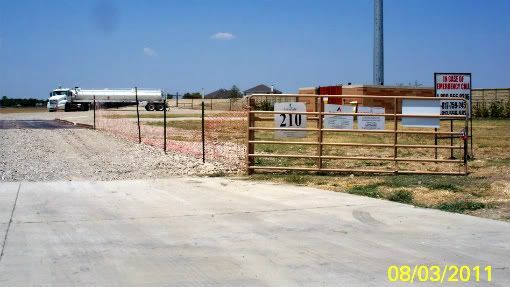 We continue to worry about all our neighbors in the southernmost parts of Grand Prairie, TX ~ especially those living closest to the Dam and Pad Site (500 feet for our neighbors on Donnie Lane who have never signed fossil fuel leases even though they OWN their minerals)! Earthquakes reported to our south and to our north. 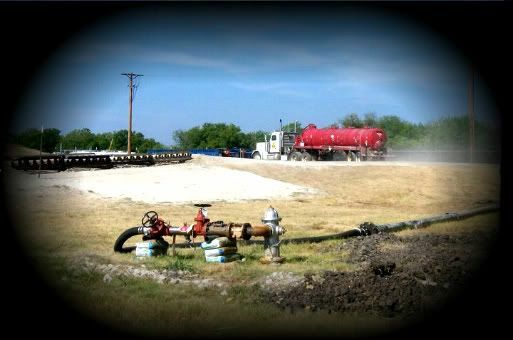 4 More Wells Scheduled for Drilling and Fracking at this Site. The ground cracking and shriveling up from the drought. It's a recipe for all kinds of catastrophic possibilities. Grand Prairie, TX Says No to Drilling and Fracking!! It also means that the Gas Operators can't have our water, either. Oh, they can apply for an "Exception," per well, but truly, can we, the people, apply for an exception? If we can't, then they shouldn't be able to either. 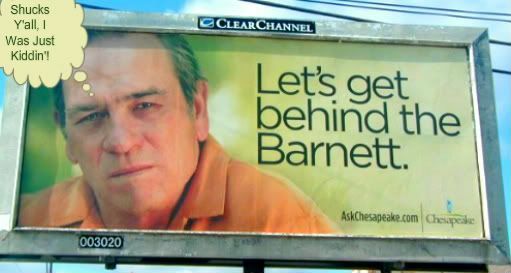 So, if Chesapeake or the others need to drill or frack during this Emergency, they might as well forget it!! We hear that the operators have already been applying for these "Exceptions" at the Grand Prairie Water Department. But we were also told today (by City representatives) that it will be very unlikely that they will get them. We need our water!! This is a very serious situation!! It's my Party and "I'll Smile If I Want To." 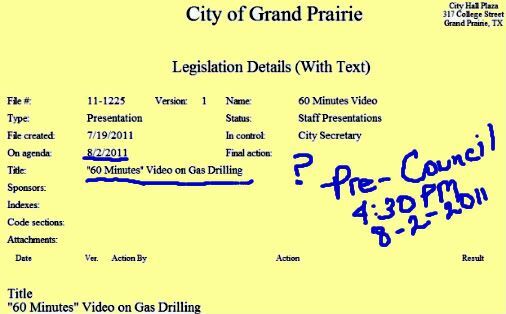 We're very glad to see that our Grand Prairie City Council is apparently going to view the 60-Minutes Video about shale gas drilling (featuring Tim and Christine Ruggiero) during their Pre-Council Meeting at 4:30 PM Tuesday. We were also very happy to see some of the City Councilmen and the Councilwoman at the Betty Warmack Library Saturday morning for a public discussion of the proposed redistricting map. Lots of references to "one man, one vote." No references to "one woman, one vote," or even, "one person, one vote." And numerous references to how "diverse" our city is. But no references to how our City Council is not diverse at all. And no. Neither our current representative, Ron Jensen, nor our proposed representative, Bill Thorn, were present. We understand. We don't like to miss our Saturday morning toons, either. So, some of us are headed to Dallas City Hall Tuesday night to warn the Dallas Gas Drilling Task Force about going down this yellow brick road.